A batch from danboruu, grab it while it's hot ! There've been a whole lot of NanoFate pics posted in danboruu recently, mostly the ones made by Torohaku. wow! post more!!!! >_< thanks a lot! She also has there a Nanoha doujin in Spanish, she said they were going to translate it to English too. Oh, thank you for sharing Alavon. Does anyone know what "Alter Ego" is about? I'm trying to find the translated version but there appears none. Is it translated? As far as I know it's not translated. The raws are in the second MegaPack if I remember correctly. I guess Einhart Stratos is Vivio's "Fate-Chan". 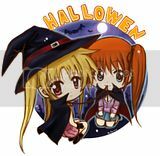 Vivio and Nanoha are so alike. All right Vivio (Thumbs up), it is time for you to befriend her. I found the pumpkin headband of Fate funny. I agree, it's a really great pic. I know this isnt really a NanoFate picture...but it's the image thread and I personally got a laugh out of it. It explains why Vivio's device can move! hehehe.